The Dependency Zone is defined as physical or mental impairment with substantial and long-term negative effect on the person ability to do normal daily activities(1). Simple things such as bathing, toileting and grooming become difficult because of this impairment, and therefore that person may become increasingly inactive and dependent on others. We need to understand that minor changes in lifestyles can be a precursor to more serious issues as inactivity set the seen for increased dependency. Watch out for elements of frailty, such as slowness, weakness and weight loss that strongly predict future disability(2). Severe disability requires full care, in a dependant zone such as a nursing home. This blog casts an eye on ageing, disease and disability. If this sounds morbid or depressing, it doesn’t have to be. Instead I hope that the following insights will help motivate people, particularly those in their middle age, to take action. The Dependency Zone is not a compulsory part of ageing; you can do something about it. With the right information and perhaps a change of mind-set it is entirely possible to avoid or postpone your entry into the dependency zone, and live an active, fulfilling retirement and old age. Click here to find out your vitality score, the health risks you currently face, and how to lose the fat and get your vitality back. 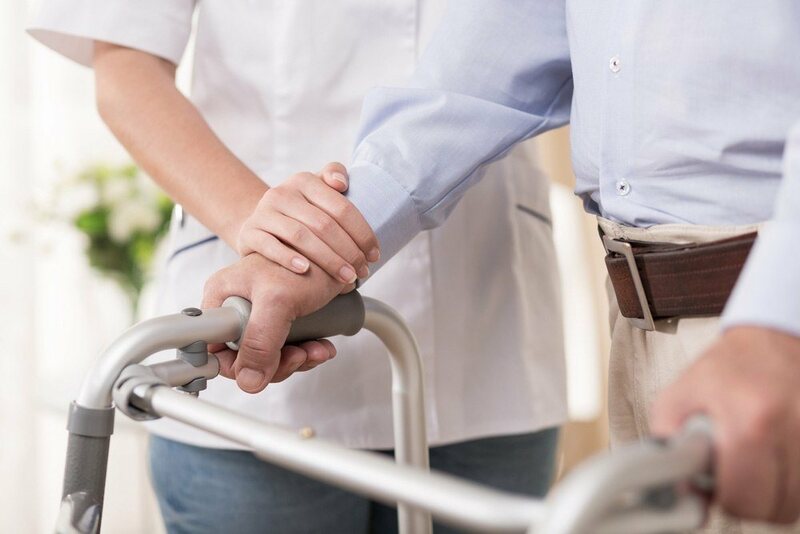 The general perception is that disease, disability and dependency are part of the normal ageing process and therefore you may feel that this is out of your control. Unfortunately this encourages elderly people to accept and settle for a false fact, while they could invest their energy to turn things around and get back to a normal independent life. How many older people do you know who have resigned themselves to a poorer quality of life because they believe this is normal when you get older? This impression also shifts governments from taking appropriate action to reduce rates of disability and dependency. Despite heavy expenditure the crises continue to expand to drain national resources. Pushing governments to increase tax to meet the increasing demand for medical and social care. If we assume ageing is the culprit, the problem is going to get worse. Life span in the UK has risen by 35 years over the last century due to improvement in living standards, public health and medical service. On the other hand, health span has declined significantly mainly due to high rate of chronic diseases. Creating a serious gap that needs to be filled with increasing medical and social care. Let’s debunk this myth that disease and disability are an inevitable part of old age. While they are a common factor we also see some individuals staying strong, fully functional and independent, up to the end of their life. Are they special, or could more people do the same? Medical research also suggests that physical inactivity, another common factor in old age, is the underlying cause of the escalating disability and dependency crisis. Science shows that the body composition starts to change at the age of 45. Muscle mass diminishes while the body fat mass expands and is redistributed to the body mid-section. This takes place as a reflection of natural body tendency to shut down. Body cells become less sensitive to insulin action and metabolism slows down significantly. This is parallel with fall in the person aerobic capacity, the body ability to process and utilise oxygen. I’m sure many readers will attest to having ‘filled out’ around their middle in their mid to late 40s. These changes are the early warning signs of disability and should serve as a reason to take urgent action. At this point you have two options (although many people will think that it’s inevitable). You can either jump out of your bed and exercise actively to trade fat for muscles and rescue back your health and vitality, or let the natural decline take place and progress to a serious loss of power, the ability to perform physical tasks. I have experienced these changes in my 40s, before I suffered a major life threatening medical condition. At the time everyone was advising me to slow down and listen to my body but fortunately I decided to take a different course. I have not only regained my life back but also set a programme to stay active for the rest of my life. I’m now able do more in my 60s compared to my 40s, because I took action. The trend is reflected in the vitality curve. 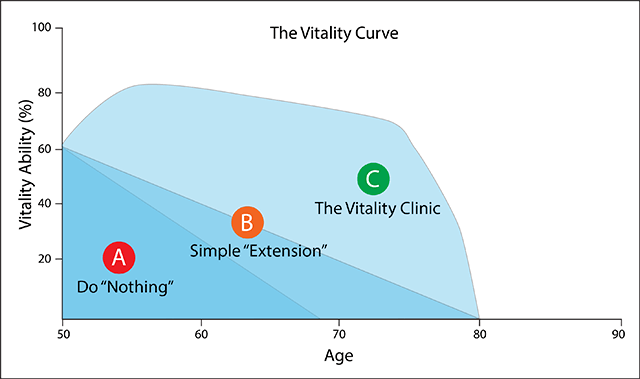 The Vitality Curve graph above demonstrates clearly how those who adopt the vitality clinic lifestyles can increase their vitality dramatically up to the age of around 70, and then maintain high levels of vitality throughout their 70s and 80s. Whereas those who resign themselves to the ageing process and do nothing, or those that have a mind set that as they age they should do less, see their vitality decrease steadily over the same period. A sedentary lifestyle, with or without disease, results in generalised muscles loss, sarcopenia: the commonest cause of disability. With considerable loss of vitality and ability people lose their confidence, self-esteem and succumb to a lower quality of life of disability and dependency. The Dallas Bed Rest study conducted in 1966 was followed up 30 years later in 1996 with another study. Five 20 year old men were subjected to 3 weeks of bed rest. The study confirmed that 3 weeks of bed rest had more profound impact on physical work capacity than did 3 decades of ageing(3). This confirms the lack of physical activity can result in accelerated ageing even in young individuals. So physical inactivity is the real cause behind disability and dependency. This suggest a great potential for prevention of dependency if those in their 50s decide to stay physically active for life. This fact is supported by undisputable evidence in medical literature. An 8 week study of 87 to 96 year old women confined to a nursing home showed that resistance exercise tripled their muscle’s strength and increased their muscles size by 10%(4). This confirms that disability and dependency at old age is not only preventable but also reversible, when it happens. I have met many patients who are committed to do everything to stay strong and active. They think staying independent is the most important value in their life. This is perfectly reflected on a study that reviewed opinions of elderly ladies diagnosed with osteoporosis on the subject. The majority of participants felt life is not worth living and they preferred to die rather than to live with any serious disability. The following case study demonstrates how it is possible to reverse the so called ‘signs of ageing’ and actively improve quality of life in later years. An 80 year old ex-cyclist was devastated to be diagnosed with a multitude of medical conditions in his 70s. He was taking a variety of medication for diabetes, high blood pressure, high cholesterol, enlarged prostate, gout and arthritis. He came to see me with insomnia, severe back pain and immobility. He could not lie flat in bed at night and had to sleep on a specially designed recliner chair, to support his severely curved back. He weighted 103 Kg (BMI 31.5), BP 160/100, and Cholesterol high at 6.7 and HA1C (reflect diabetic control over last 3 month) was very high at 9.2. With my support and the Vitality Clinic personalised health care plan, in 6 months he was like a new man. He lost 2 stones in weight. His blood pressure normalised at 123/68, Blood sugar normalised and HA1c down to 6.8 (normal 6.5), Cholesterol down to 4.3—and he came off his regular medications. He went back to enjoy normal life: gardening, household work and got back on his bike doing several miles on regular basis. This is at 80 years of age when many people would believe that there was nothing more they could do to improve their health outcomes. Instead he was able to significantly improve his quality of life, become more active and most importantly enjoy life again. People enter the dependency zone either due accelerated ageing or onset of chronic diseases such as high blood pressure and diabetes, stroke, heart disease, and dementia. This may sound like you are going to need to visit half a dozen specialists to reclaim your independence. This is not true as we can summarise all factors contributing to dependency into a single condition: a mismatch between genes and environment. People dread the solution as they think they should visit every single hospital departments seeking help to fix their problems. I can reassure you that dealing with multiple chronic diseases the fault is almost always one but we need to push several buttons together to initiates the healing process. This is The Vitality Clinic’s philosophy and approach. Which option do you want to choose for your old age? Resign yourself to the perceived inevitability of the ageing process, or take control of your vitality delay even avoid entering the dependency zone in later life? The Vitality Clinic personalised medical approach focuses on the full half of the glass rather than the empty half that represent diseases. It strives to create positive health irrespective of your medical and family history. We believe everyone should enjoy a happy and independent life with abundance of vigour and vitality. This is every day normal pattern we see with successful agers in their 80s, 90s and even beyond the 100 mark. If you have any queries about the subjects covered in this post, or concerns about your health that you would like to discuss, I can offer you a 10 minute free consultation. Call our Harley Street Clinic on 020 7016 2113 to book today.